A young Lady Christobel Ampthill and her son Geoffrey. Some months after Lady Christobel Ampthill’s spectacular accident (her horse who refused to jump a flooding stream, and she was thrown into the river, and nearly drowned ), Michel Déon and his wife Chantal, came across her sitting in her car near Kinvara. * She clearly looked distressed. There was a rumour that she had not fully recovered from her accident. She was getting forgetful. Déon knocked on her window. He politely asked if she was lost? To his great surprise she answered, in fluent French, to say she was not in the least bit lost; but wanted to return to Kinvara ‘by a different route’. She was thinking out that new way home. Lady Christobel had found a perfect haven in the small town of Kinvara when she arrived in 1954. 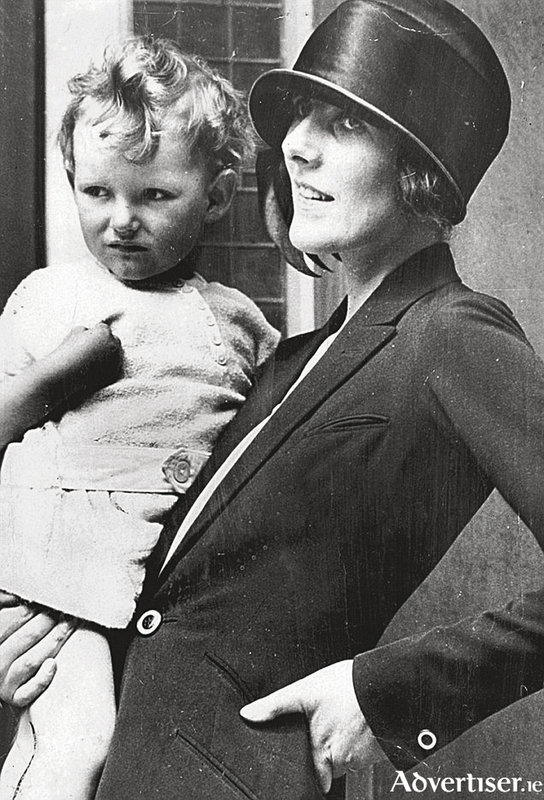 She had been under intolerable pressure in the UK following sensational law cases in the 1920s, over the paternity of her son Geoffrey. Her genuine kind character, and helpful nature, endeared her to the community. She bought Dun Guire tower house with a bawn, an ancient Martyn home, from Oliver St Gogarty, and restored it sympathetically. ** She was very hospitable. She took real pleasure showing children and visitors around the castle. She was very popular in the village, and was admired for her expert horsewoman, fearlessly riding side-saddle into her eighties. Hearing only the brief outline of the reasons why she became an exile from England, I can fully appreciate why she must have chosen with relief the friendship of a small Irish town over the hounding and hypocrisy of the British press of the day. Christobel, the daughter of Lieut-Col John Hart of the Leinster Regiment, answered for a laugh, and included her photograph. The young sailors were delighted. They took her dancing and to nightclubs, and in 1918 she married John Russell against the wishes of his parents. Christobel, however, really enjoyed the London night scene. She loved being married to the aristocratic John Russell, but she did not want to settle down and have babies immediately. She made John promise that they would have no children in the early years. She spent her evenings in London out dancing with what her husband later described as “detestable young men”. But after a visit to a Mayfair clairvoyant she found, to her surprise, that she was five months pregnant. Her husband denied paternity and sued for divorce, claiming, as did she, that the marriage had never been consummated. A very public court case followed, where the intimacies of their marriage were revealed, including their pact that they would not consummate their marriage during its early years. Embarrassingly, poor Christobel was examined by doctors, and they testified that despite her pregnancy Christobel still showed ‘all signs of virginity’. After two hearings, which she lost, she took the case to the House of Lords where Lord Birkenhead upheld the view that it was inadmissible for a husband or wife to give evidence of “non-access”, which would have the effect of bastardising a child born in wedlock. So the baby was legitimised. In 1937, she did agree to give Lord Ampthill, as he now was, a divorce. She tried to live quietly in the UK, but she was always the subject of gossip and talk. She later found peace in Ireland. Geoffrey Russell grew up in England. He went first to school at Cheam (where he shared a bedroom with Prince Philip ), and then at Stowe. After leaving school and being in the Home Guard, he set up a company with a school friend to exploit an invention to make tanks amphibious. Out of this venture they each made £10,000. He joined the Irish Guards and after D-day was sent to Brussels, but almost immediately was “squashed by a three-ton lorry” and broke his pelvis in six places. After leaving the army, he became general manager at Fortnum and Mason and from there went on to be a theatre impresario, being involved in the very successful West End musical Salad Days. In 1973, the third Lord Ampthill died. Geoffrey Russell’s claim to the title was contested by the third Lord Ampthill’s undoubted legitimate son. The contest went before the committee of privileges of the House of Lords in 1976. But by then it was possible to prove parternity by DNA testing. The committee of privileges found no grounds to overturn the previous Lords ruling, and that Geoffrey was indeed the son of John Russell and his wife Christobel. He was able to take his seat in the House of Lords. He died in April 2011 at the age of 89 years. Sadly Christobel did not live to hear the definitive ruling on the legitimacy of her son. She died during the 1976 hearing. Michel Déon observes that ‘even though Christobel was a mother, she was a virgin’. More of Déon’s observations next week. Michel Déon, a very successful French writer, lived in Galway for more than 40 years. His gentle observations of the people and places he and his wife and children observed are published in his book: Horseman, Pass By! Translated by Clíona Ní Ríordáin, is published by The Lilliput Press, Dublin, now on sale €12. **Gogarty never lived there, but liked to entertain WB Yeats and Lady Gregory and other Irish literary illuminati from time to time. It is now the property of Shannon Development. I have raided The Irish Times archives for some details in this week’s Diary.